Project management companies face a huge challenge when it comes to acquiring customers. The project management industry is huge—it is set to hit $6.7 billion by the year 2022—and the number of tools on the market is exploding as well. That means that companies in this space face an unprecedented amount of competition when it comes to getting in front of potential users. To cut through the noise, the best of the best are using digital advertising. We analyzed advertising spend from some of the top project management companies out there—Aha!, Monday, and Smartsheet—to understand just how they are setting themselves apart in this competitive landscape. 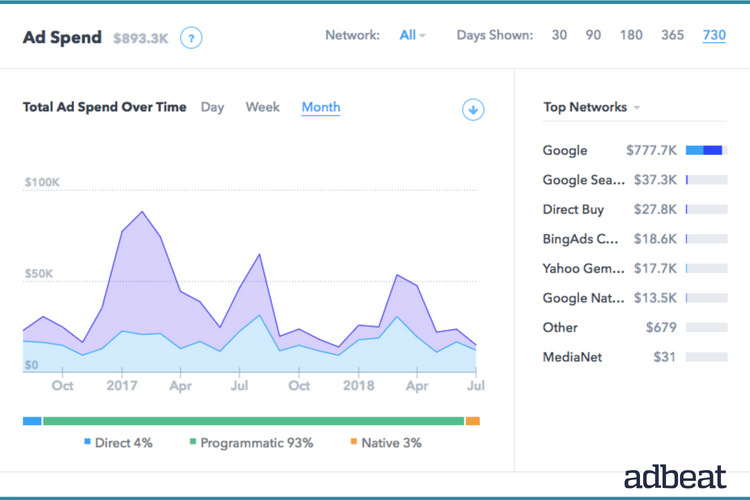 We looked at the demographics they’re targeting, the networks they’re using, whether they’re finding text, video or image ads more successful—and we collected all the results of our analysis here, so you can learn how to better spend your advertising budget, or prove to your boss that you need one today. Aha! is a product management tool that is used to drive product strategy using visual roadmaps. The main aim is to help teams keep track of the “why,” “when,” and “why” of their roadmap. It integrates with other project management tools like Jira and Asana. Founded in 2013, their bootstrapped journey has been phenomenal, considering that they have more than 200,000 users worldwide. Aha! is the only company in this list to have refused VC funding. Aha! has spent around $1.6 million in the last 24 months, almost entirely on the Google Network. 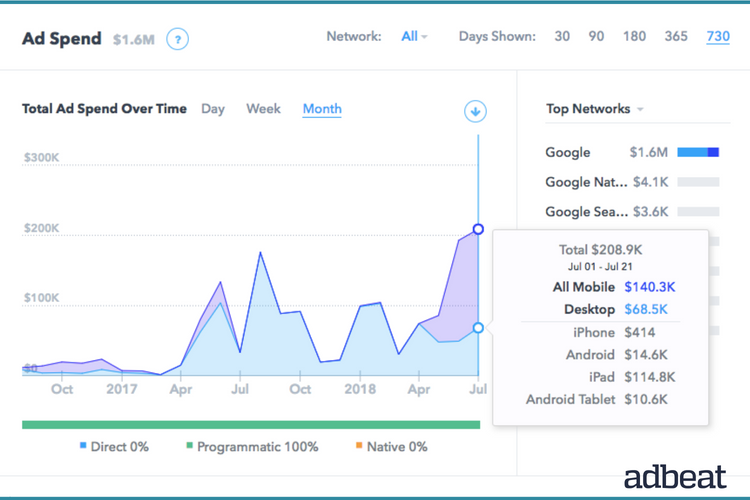 While they have been mainly concentrating on desktop ads, they’ve also ramped up their ad spend on mobile ads since April. For example, so far in July, only $68.5k was spent on desktop ads, while a whopping $140.3k was spent on mobile ads. The concentration on mobile ads coincides with their launch post-April of integrations with apps like Google Hangouts, Asana, Jira, Rally, and GitHub. Out of $140.3k spent on mobile ads, $114.8 were used to target iPad users. Aha! has been spending heavily on FashionBeans and ESPN in the last couple of months. FashionBeans is a popular publication that blogs about men’s fashion, style and grooming. But, why would a B2B tech company spend heavily on sports and men’s fashion websites? Eighty-five percent of FashionBean’s customer base is less than 44 years old with the major chunk coming in the 25 to 44 age range. According to a 2018 Pragmatic Marketing survey, 60% of product managers are men and 63% of them come in between the ages of 25-44. Most of them are millennials and are more internet-savvy compared to the rest of the project managers. Also with ESPN, most of the sudden spike in advertising in June to July coincides with the start of the MLB season. Aha! has also spent a lot to advertise during events like the NBA Finals. This could be an attempt to cash in on ESPN’s 13% year-over-year growth of millennials in primetime viewership. We can assume that Tutorials Point is a steady source of traffic for Aha! as they’ve been running ads there for quite some time. Aha! has even increased the ad spend there in the last two months. The pages Aha! targets with its ads are the ones that offer readers project management tool hacks and other related topics. Aha! mostly uses image-based ads and publishes only a few text-based ads. After analyzing all their creatives, it seems that they could’ve done more testing to see if it improves conversions. Aha! landing pages all use lead generation forms as a way to encourage leads to take the next step and get started. There are two types of landing pages. As you can see, this page is highly visual. Toward the right, there’s a GIF of the app in action. Further down the page there are logos of some of their more well-known customers. This uses social proof to get leads to take action. There are more screenshots that show the different features, and even a video at the bottom of the page to help convince leads to sign up. It’s a shorter page and the content is highly textual. All of the visuals we saw in the desktop version have been replaced by FAQs. They probably took this route to increase the page’s loading speed on mobile devices. One thing worth noting is the lack of company logos on this page. The mobile landing page focuses more on sharing information and value than focusing on social proof. TAKEAWAYS: What we can learn from aha’s ad strategy! In mobile ads, Aha! has been putting almost all their money on iPad users. This is because iPad has become the product manager’s best friend across several industries. The key is to target devices that your audience uses the most. Ask yourself questions like: Does your audience consist of mostly Android or iOS users? Do they use iPads or iPhones? Aha! placing ads on websites like ESPN and FashionBeans is a great example of targeting the interests of their audience. 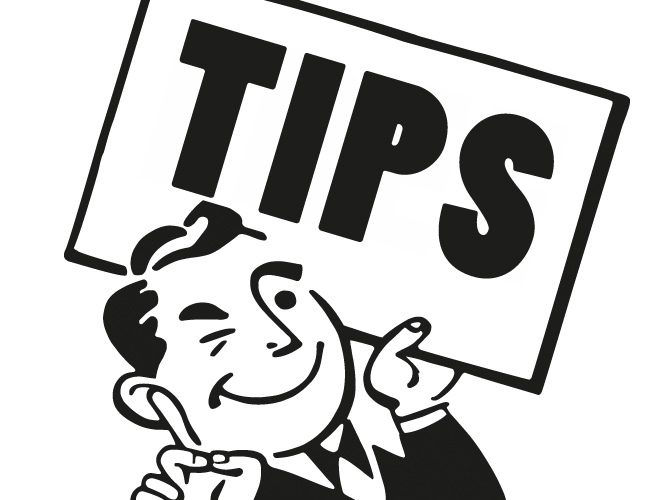 Be sure that the pages you target with ads are relevant to the audience’s needs and interests. For example, users checking out player stats may or may not be interested in a project management tool. The best thing to do is test where you place your ads and check conversions. Monday — formerly known as dapulse — is a visual project management tool that mainly supports customers in non-tech spaces, such as architecture and the food industry. While most project management tools dominate the tech market, only 30% of Monday’s customers are from the tech world. It was founded back in 2012 with $1.5 million from seed funding. It is one of the hottest startups in project management since recently raising $50 million in Series C funding. This takes their total funding received to date to $84.1 million. They also have more than 35,000 paid customers with a year-over-year growth of 3x. Monday started spending on ad networks and direct buys in January 2018. They’ve already spent a total of $1.1 million, of which $961.2k was spent on direct buys. 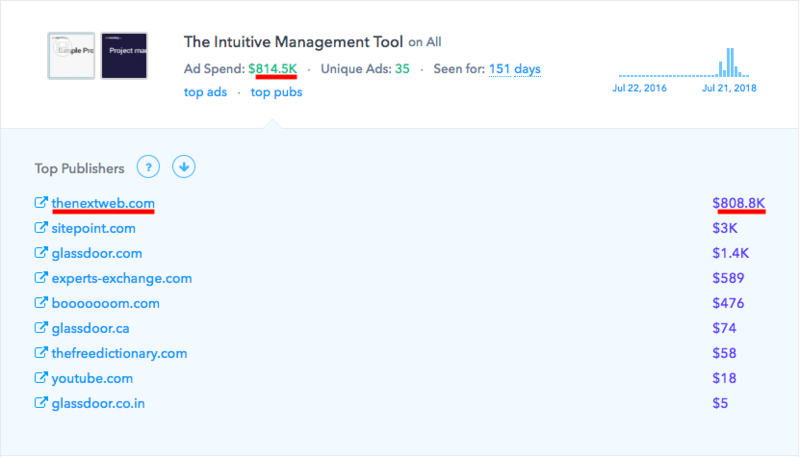 While they’ve run ten direct buy campaigns so far, most of their budget was spent on one campaign called “The Intuitive Management Tool.” The total ad spend on this campaign amounts to $814.5k, of which $808.8k was spent on TNW. They targeted articles related to AI, Bitcoin, Bixby, SpaceX, #deleteFB and other trending topics. The target audience for these posts is comprised of early adopters. This fits well with their tool because of its innovative approach to project management. Other than TNW, Monday is also experimenting a lot with Glassdoor through the Google Search Partners network. These ads give Monday exposure among project managers who are searching for “project manager salary,” “project management interview questions,” and similar keywords in Glassdoor. 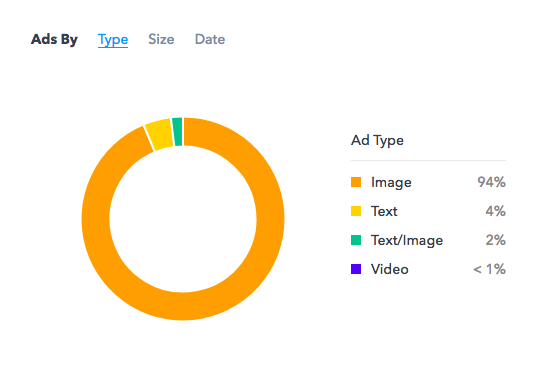 The fact that Monday has published 143 unique ads over the course of 152 days shows us that they are doing a lot of testing to find a working formula. They’ve also started running ads on sites like Dummies and Dictionary. Once they find a winning combination, there’s a good chance they’ll scale things up. These campaigns are run on evergreen content and thus have the potential to drive constant traffic, unlike trending posts, as seen in TNW. Monday’s ad strategy mostly focuses on image-based ads. 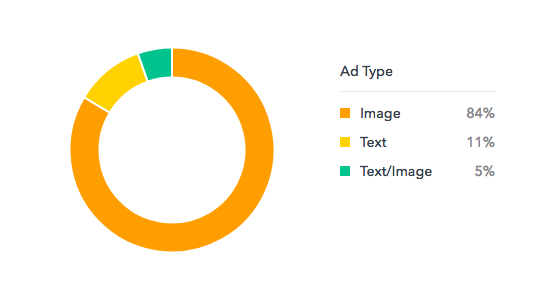 As you can see, 94% of their ads are image-based. These GIFs have the ability to arouse curiosity because most project management tools aren’t this visual. None of their competitors are using the power of GIFs. These are the two main USPs of Monday. After testing both types, they seem to have found more success with the “simple” pitch as they’ve ramped up that campaign recently. The CTAs used are mainly “Create free account.” This makes sense because their business involves a lot of free users at the top of the funnel, which trickles down to a few conversions. The intention is to attract a huge user base to try out their free trial. According to Capterra, out of 1,00,000 free users, Monday has only 30,000 paid users. This page has a GIF running in the background — giving leads a sneak peak of what’s within the app. 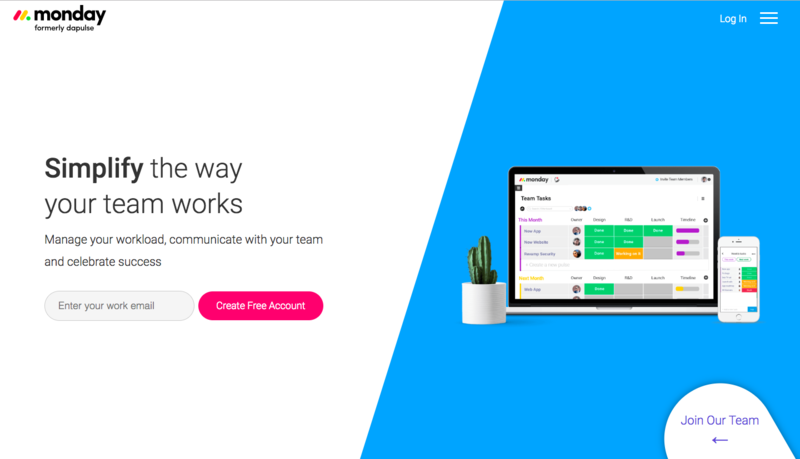 It’s interesting to note that neither landing page relies on tactics like FOMO, scarcity, social proof, or customer testimonials to encourage leads to start a free trial. Monday has distinguished itself from its competitors by instead focusing on two things: simplicity and visual appeal. TAKEAWAYS: WHAT WE CAN LEARN FROM MONDAY’S AD STRATEGY! Using GIFs in image ads is a really good way to stand out! Monday does this well by using GIFs to highlight the app’s simplicity and visuals. If your product has two main USPs, always test both to see which results in the most conversions. Do not stick to the one that you “think” is the best; instead , use what appeals to your audience the most. Smartsheet is a spreadsheet-based management software primarily meant for project managers. Of all the three companies we’ve focused on, Smartsheet has been around the longest — it was founded in 2005. Since then, they’ve raised a total of $113.2 million, with the latest round producing $52.6 million in Series F funding in May 2017. They are the only company on this list to go public. They have a whopping 3.6 million users, with 90% of Fortune 100 companies using Smartsheet’s tools. The app is designed with a similar look and feel of a standard spreadsheet so the learning curve is less steep. This might be why Smartsheet is used by more than half of Fortune 500 companies. Smartsheet is also used in a wide range of industries. For example, more HR teams use it. Smartsheet has spent $893.3k in the past 24 months, with $777.7k of the total spent on Google’s network. However, they’ve been slowly reducing the amount of money spent on mobile ads. The average monthly mobile spend has dropped from $23.3k/month in 2017 to $12.9k/month in 2018, while the average desktop spend has slightly increased from $17k/month in 2017 to $17.7k/month in 2018. Their heavy spend on mobile ads last year mainly targeted iPad users. This might have been an attempt to increase their app downloads. There is a possibility that although they have millions of free users, the number of paid conversions could’ve been pretty low. This could be the reason for their sudden cut in mobile ad spend this year. Like Monday, Smartsheet also has had decent success with Glassdoor via the Google Search Partner network. They’re also targeting keywords like “salaries of scrum masters” and “salaries of project managers” with decent success as they’ve increased the spend recently. They’ve also featured ads in websites like Excel-Easy and Excel Functions targeting posts about excel sheets and project management. This is a great tactic to target MS Excel’s customer base since Smartsheet is very similar to it. 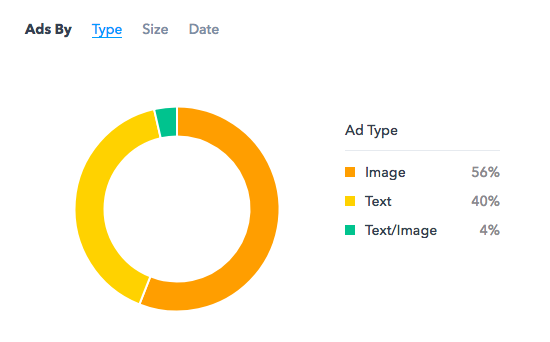 Smartsheet ads are split almost equally between image and text ads. 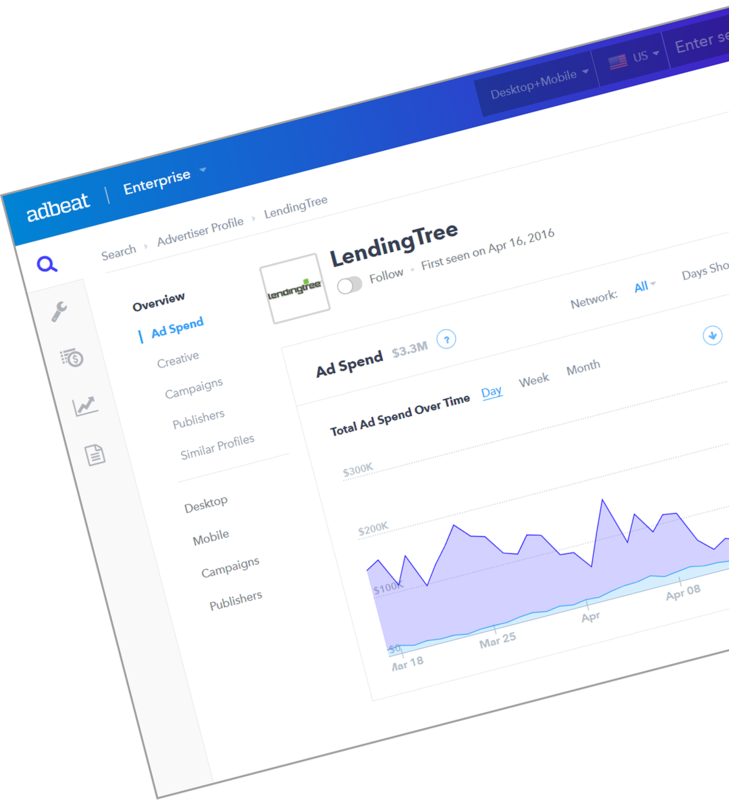 Since the content of these ad types are the same, it’s likely that Smartsheet is testing to see which is most effective to attract and convert more leads. Inside the creatives, “Gantt Chart Template” is their most used header. For image-based ads, the Gantt chart is also part of the creative as a visual in the background. 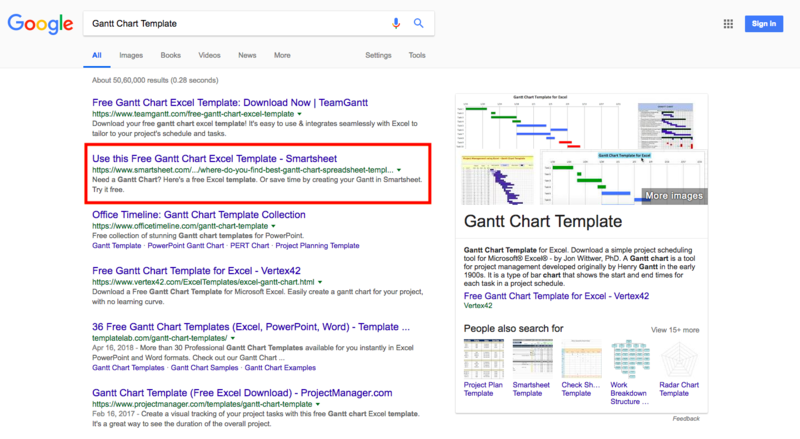 This makes sense considering “Gantt Chart Template” has over 27,100 searches per month in Google. 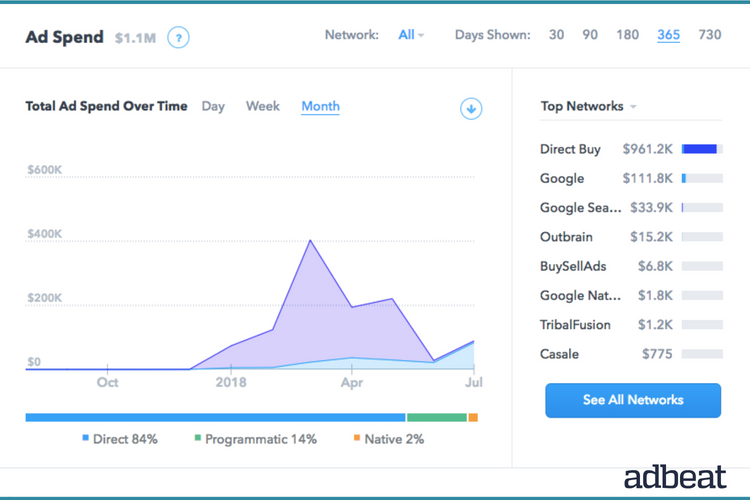 This shows that Smartsheet understands its audience, which is why they’ve created ads that are more likely to attract interest. “Nothing to install” is a phrase they use in all of their image ads. While this might have been a great pitch to compete with Excel years ago, it doesn’t make much sense in 2018, when everything is cloud-based. Smartsheet has done a great job with creating specific landing pages that are very relevant to the creatives. For example, they have dedicated landing pages for Scrum Software-based and Gantt Chart-based creatives. 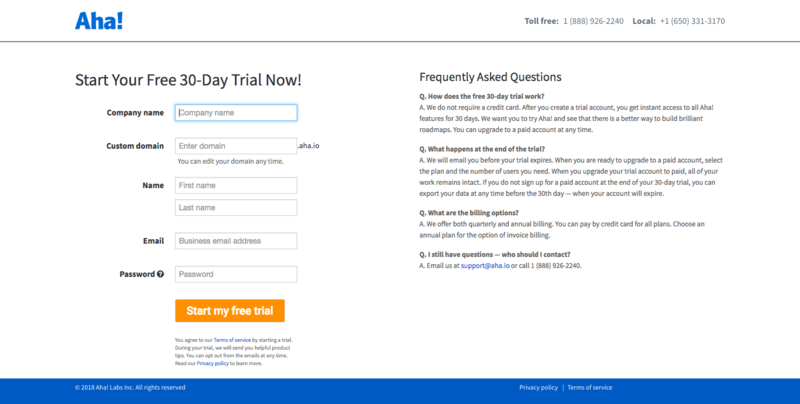 Both of these landing pages are used to collect email addresses in exchange for a free 30-day trial. The “Gantt Chart” landing page has a GIF that shows how the app works, followed by a list of features. For social proof, they’ve included the logos of well-known customers like Netflix and Cisco. The “Scrum Software” landing page uses a video to show how Smartsheet works. Customer testimonials are used to increase the trust factor for this page. They’ve also used a comprehensive comparison table to show that they offer more features than their competitors, including Asana, Basecamp, and Microsoft Project. If you have features that are better than your competitors’, this is a great way to showcase that fact. TAKEAWAYS: WHAT we can learn from smartsheet’s growth strategy! Add your best organic keywords to your ad copy. If these keywords already attract organic traffic, then chances are they’ll also work for paid ads—as long as you get the targeting right! Create landing pages that match your ad creatives. Many advertisers make the mistake of creating niche-focused ad creatives that lead to their homepage with generic content. This can kill your conversion rates because it isn’t clear to leads what they’re expected to do once they get to the page. Each of the companies we highlighted have a distinct ad focus. Whether it’s their messaging, the types of leads they target or the ad type used, each company has done a good job of differentiating itself from its competitors. When developing your next ad campaign, it’s important that you have a clear understanding on who your audience is and what they’re trying to accomplish. Tailor your ads to speak to their specific needs in order to increase lead conversions. The more specific your targeting is, the better your chances are of standing out and getting noticed by your target audience.